This post, Invisalign Secrets, is sponsored by Invisalign. Are you thinking about Invisalign® Treatment for someone in your family–maybe even yourself? You might have noticed some of my Invisalign posts, and are interested in learning some more about Invisalign–you’ve come to the right place. Today, I’m sharing some Invisalign secrets with you. 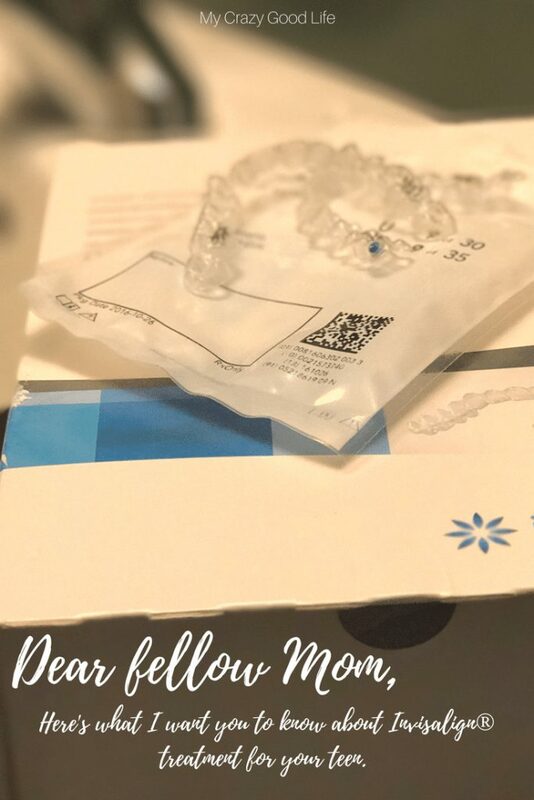 I’ve talked about our consultation process with our teen, I’ve also shared some gift ideas for people starting Invisalign, and what I’d say to moms who are thinking of getting Invisalign for their kids. I love sharing my Invisalign secrets! 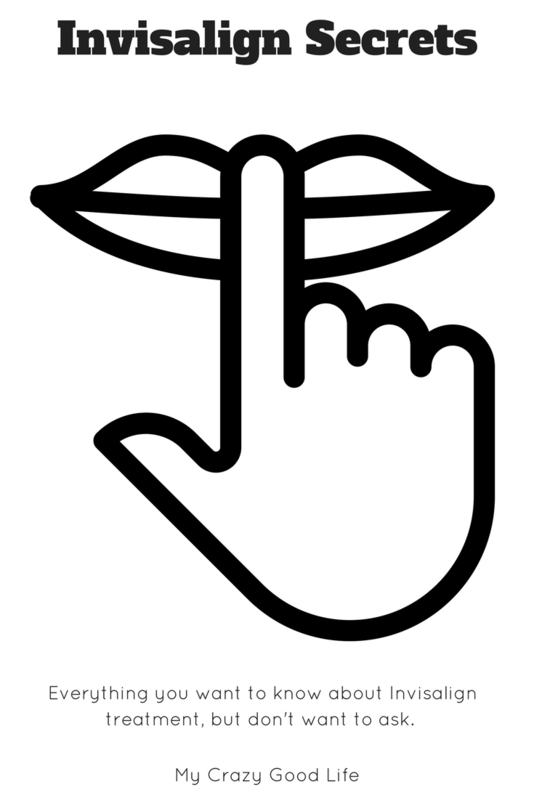 Here’s something that is not a secret. Invisalign is a great option for orthodontic treatment. If you are curious about the process, here are some things that no one seems to talk about much! Many orthodontists are charging the same price or just slightly more for Invisalign. It’s becoming more and more affordable to do Invisalign versus traditional braces. Pain levels are not that bad! There are always going to be horror stories. In reality it’s less scary than all that. The first few days with each set of aligners are uncomfortable. Once your teeth adjust to the movement the pain level is manageable. A trick to managing the pain is to change your aligners at night. Take a pain medicine, put your new aligners in, head to bed. In the morning you’ll have slept through most of the initial discomfort. Will I have to wear rubber bands with Invisalign? How about attachments? Attachments and rubber bands can be a part of Invisalign treatment, but that doesn’t mean that they’ll be seen by others. Sometimes rubber bands are used to help move the process of straightening your teeth. Jack has had to wear rubber bands at night and after school only so far. When I had my Invisalign, I wore rubber bands at night only. Of course, your experience might be different, but these are ours. Attachments are little “studs” for lack of a better word that are affixed to your teeth to help rubber bands attach and also to make sure your Invisalign clear aligners are in the right place. Unlike traditional braces, attachments are mostly covered by your aligner trays and they don’t typically give you mouth sores or rubbing. The amount of attachments you might have will vary but in terms of treatment they’re pretty normal. What is IPR? Do I need it with Invisalign? If you don’t have enough room in your mouth for the movement that needs to take place you might have to get IPR treatment. This means the doctor will file between your teeth to create some more space for your teeth to move into the proper positions. It doesn’t hurt quite as bad as those first few days of treatment but it definitely does create a bit more pain than normal. It can seem like a scary or overwhelming process but really it’s not that bad and it sounds worse than it really is. Trust me, the sound is worse than the actual event! Because orthodontic treatment of any kind is expensive, shop around. It’s never a bad idea to check in with multiple options so you can get the best price based on what you need! Comparing prices is tricky though because you don’t want to just go for the cheapest option. Make sure you are evaluating the experience and work of the doctor you choose as well as their pricing. 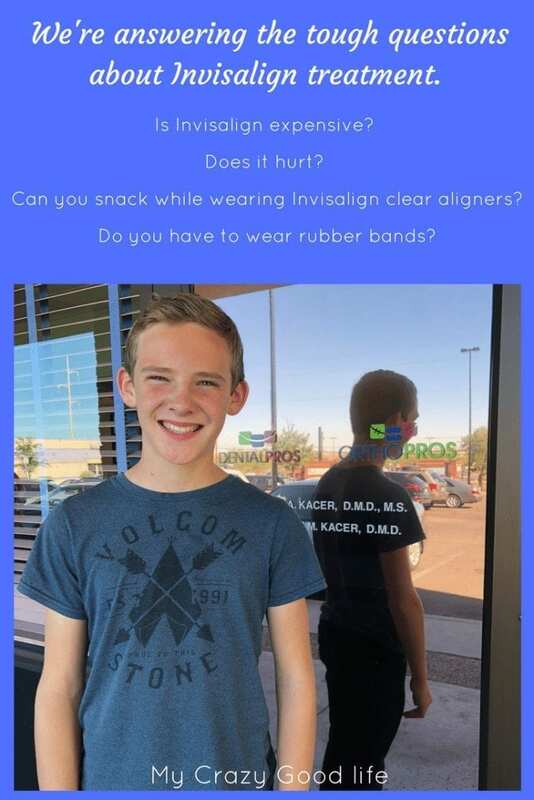 If you’re in or around the Tucson area, we highly recommend Dr. Kacer at OrthoPros. Can you Snack with Invisalign? While it’s great that you can eat whatever you want with no restrictions (because the clear aligners come out), you do have to be careful about constantly removing your aligners. They should be worn for *ideally* 22 hours per day. 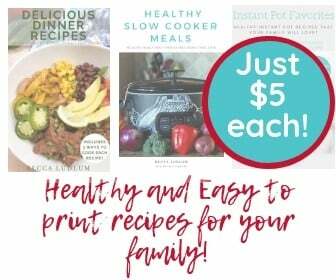 That’s hard to do if you consider meal times, snacks, brushing, etc. Try and keep your snacking and meal times to a minimum so that you aren’t cheating yourself on wear time! You can have whatever snacks you want without damaging your equipment and that’s a blessing, just make sure that you don’t overdo it by removing your aligners for more than a few hours each day…for cleaning sessions as well! Another thing to remember is that your bite will be constantly changing. This means that sometimes it can feel weird to talk and eat. You can’t always bite the whole way down because of the shifting teeth. In the end it’s all pretty great because the aligners will get you to a perfect bite! I have been doing Invisalign for a year now! It is unreal how fast I noticed a difference in my smile! I only have 4 weeksto go and am in shock at how quickly this has flown by! I only wish I had done it sooner! My Invisalign hurts really bad right now I have had them for three days now and I can barely talk with them in. I also have bands with them. Sometimes I just don’t want to have an Invisalign. Hopefully it gets better.